I took this shot at 7:05 the other morning, just before walking out the door to pack a small mountain of boxes related to our last round of QUITOKEETO. It takes quite a lot to get each package bundled safely and sent on its way, and a proper lunch break on packing days is something I look forward to. We clear the long table, throw down a few sheets of butcher paper, and put out a spread. There's usually a thermos of tea, some fruit, a chunk of Wayne's bread, a bit of cheese, and whatever I've managed to pull together. I try to make things like this. You have to look closely, there's all sorts of good stuff in this salad - chickpeas, celery, black olives, pepitas, avocado, blanched broccoli...I was after crunch and substance. A salad that could stand up to a few hours in a container without collapsing. A couple notes....I used arugula because I love it, and it was what I had on hand. That said, shredded romaine would be a nice alternative - more structure and crunch. And, I did about ten minutes of prep the night prior - a bit of chopping, and pulling together the dressing. The dressing, by the way, is great on all sorts of things - broccoli, asparagus, cauliflower. And I bet you could do a potato salad with it that would be A+. 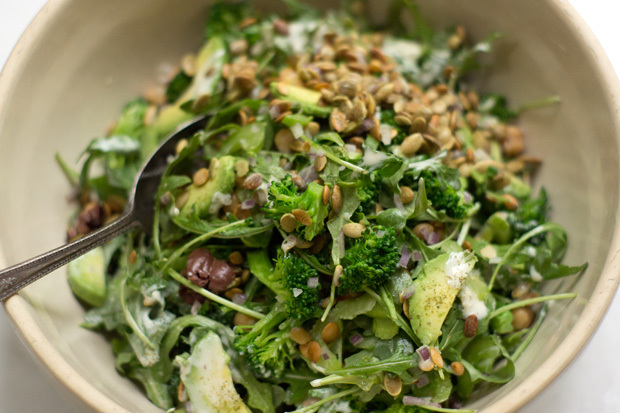 In a large bowl combine the celery, chickpeas, arugula, pepitas, olives, onion, and broccoli. Set aside. Make the dressing by smashing the garlic into a paste in a mortar and pestle (or alternately, with a knife). Stir in the miso, then add the mirin, and vinegar, and combine until it all comes together. Add the cumin and the yogurt, and stir again before finishing with the heavy cream. Taste, and adjust the dressing if needed. Before serving, add half of the dressing to the other ingredients and toss well. Keep adding more dressing until it is to your liking, adding the avocado toward the end so it maintains its structure. Serves 2-4, depending on what else is served. Roasted delicata squash and kale tossed w/ orzo pasta & salted yogurt dressing & I try to answer a few questions about living with marble kitchen counter tops. This could very well be my favorite salad recipe from Super Natural Every Day - shaved fennel, arugula, zucchini coins, feta, toasted almonds.